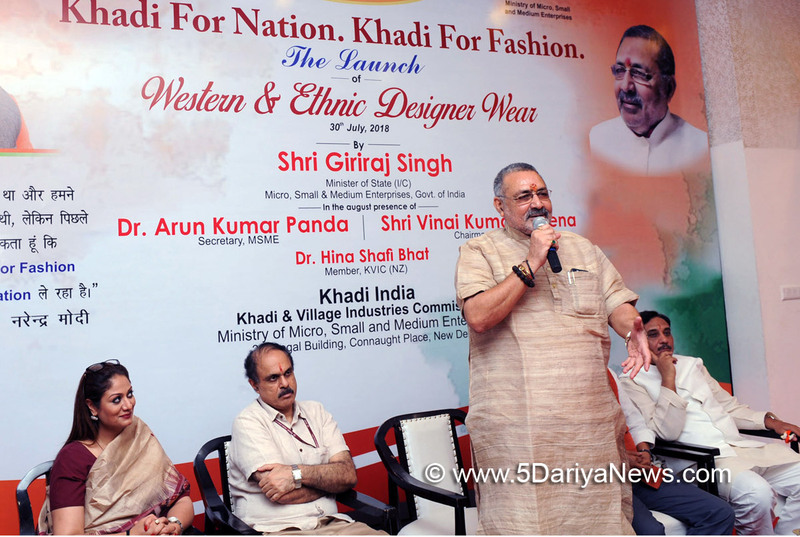 Union Minister of State (I/C) for Micro, Small and Medium Enterprises (MSME) Giriraj Singh launched Western and Ethnic Designer Wear collections at Khadi Bhawan at Connaught Place here today.During the launch the Minister said that Khadi has come a long way after Prime Minister’s call to make Khadi the signature fabric of India and a means for the economic transformation of the country. The Minister hoped that in the coming days Khadi will become a global fabric.The Minister informed that with the launch of the Solar Charkha Mission, employment will be generated for up to 5 crore people. He appreciated Khadi and Village Industries Commission for its high growth in sales as well as annual turnover in the last four years. KVIC Chairman Vinai Kumar Saxena said as Khadi is a natural fiber, is hand-spun and hand-woven and has zero-carbon footprint, it will become a favourite of the youth.MSME Secretary Arun Kumar Panda was also present on this occasion.